This is Part 4 in the series, Weaver Marathon. 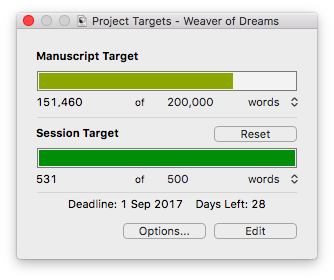 Last night I wrote another 500 words. It feels like I'm starting to find my stride at last. I did break one of my own rules (I edited something) but...meh. I didn't get home last night until half past 7, courtesy of a dental appointment. I'm still tired and boy, am I glad it's the weekend! The weather forecast is looking grim for Melbourne and my only family commitment is my daughter's first birthday lunch. Hopefully I'll make up some ground in the word count. Since I don't really have much more to say, here's what I wrote last night. It's something of a flashback, to an event that occurred almost a hundred years before the story begins. Torchlight breached the darkness. The flickering light illuminated roughly hewn walls and moved like a halo over the two men walking along the passage. Their boots scuffed along the stone floor. They heard the scurry of rats escaping the light and the occasional dripping of water that seeped through the limestone ceiling. The man holding the torch set a brisk pace. He was of average height with a powerful frame more befitting a wrestler than a mage. His short, brown robe was tied with a stout leather belt from which hung a slender, silver knife. The hood hung down his back, leaving his head exposed. He had a tuft of short, grey hair that gleamed in the torchlight. His nose was broad and his skin bore the faded olive complexion of a southerner who’d spent too many years in the north. His companion trailed the mage by several paces. He was taller by a head and shoulders yet his steps were leaden and moved at half their usual pace. He kept his head hidden beneath the hood of his grey robes partly out of comfort partly because he didn’t like water drops down the back of his neck. As he followed the mage, his fingered the ornamental ploughshare hanging beside his left hip. My sword should be there, he thought. He wished it was; its absence made him question the wisdom and validity of his calling. Was it truly faith or was it remorse? A life in the service of God was not one his family had ordained, nor one, he admitted, that he himself had foreseen. Was God testing his calling? These were questions with answers he would one day have to reconcile. Another day, he promised, not now and not here. There were more pressing concerns in this dark, alien place. As if to drive home his sense of foreboding, they passed a series of open graves recessed into the wall. The flames of the torch cast the bones in a sinister contrast of light and shadow. The bones were gracile, the skulls elongated and delicate. He had seen his fair share of the dead—some by his own hand—but the sight of these ancient graves disturbed him. They were not quite human…what had the pagans called them, feniog…bwgalen? “You are sure about this, Roger?” he asked, overcoming his reservation at last. It was the first time either of them had spoken since beginning their descent underground. The acoustics of the limestone gave his voice a hollow, disembodied quality that made the hairs on the back of his neck stand.